Pity my mother, her ilk, and their culinary epiphany in the fifties. Enthralled with the freedom the new convenience foods allowed, when shopping for groceries they’d scoff at the produce section – former prison guards – sitting quietly in the bins, as they merrily stacked canned vegetables, tasting of tin, and sugary fruit cocktail into their carts. “Instant Potatoes” and “Minute Rice” – wam, bam – slam dunks tossed into the mix with abandon; these staples, alongside the Spam, would keep well into the Cold War. Pity their families, as well – we had to eat that stuff. Prior to my mother’s enlightenment, she was a fine cook, but scratch cooking takes time. With more women joining the workforce than ever before in American history, she decided to try and join their ranks – radical, incendiary! – but that Home Ec degree could only take her so far. But she stuck to her guns, equating scratch cooking with backward thinking, and spent as little time in the kitchen as possible. My dad’s sprint to the front porch after a day at the office turned into a shuffle at the thought of another regrettable TV dinner. Her tossed salad, praise the Lord, at least wasn’t a pre-pack – but it was close. Mom advised me on the wisdom of the Wish-Bone dry seasoning packages, which she poured into a special bottle adding water, then corn oil to their designated lines. She shook this furiously, as if angry that making this salad dressing could also be considered cooking. She’d then pour the dressing over an anemic wedge of iceberg, from a head as large and firm as a basketball; iceberg keeps several weeks in the crisper, left unattended. In those days, she would have thought the following recipe heresy; why roast beets when canned are readily available? Growing one’s own lettuce surely would pour salt into the wound of enslavement, and why make your own dressing when Wishbone is such a crowd-pleaser? Versatile…heck! You can also smear the seasoning pack into chicken before baking. My defense is that, for me, growing lettuce is easier than shopping for it at the grocery store. And it’s just as easy to make my own dressing, following a loose rule of thumb: 1 part acidity to 3 parts oil. 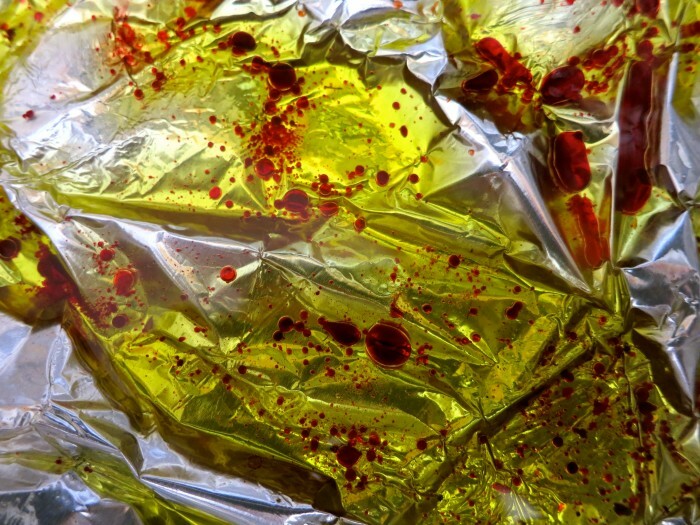 The acidity can be any type of vinegar – balsamic, Champagne, sherry, red, white or rice wine. Fresh squeezed lemon juice or a drop of juice from the bottle of capers would also do the trick. With the more intense acidic flavors, I add additional oil or a bit of honey. I use the beet-flavored oil from which I roasted my beets to season the vinaigrette. Since the oil usually used for dressing is not exposed to heat, which diminishes the flavor, vinaigrettes are an excellent medium for showcasing your finest extra virgin olive oils. Nut, vegetable and seed oils can be delicious as well. Sesame and stronger flavored walnut oils can be overly intense on their own, so tone these down with canola, for example. In the following recipe, I used the oil in which I cooked the beets to flavor the vinaigrette. Shallot, garlic, herbs and mustards are other possibilities; let your palate be your guide. In the following recipe, toasted pine nuts or walnuts may be substituted for the pecans; walnut oil for the olive oil; basil or thyme for the tarragon; honey or agave for the syrup; blue cheese for the goat cheese, and so on and so forth. Thankfully Julia Child wandered into Mom’s life in the mid- sixties; she even went as far as to plant a pot of basil on the porch – a harbinger of better meals to come. Why the turn-around? I had asked. I was hungry, her reply. Wash the beets thoroughly, leaving the skins on, and remove the greens, reserving for another use. Place the beets in a small baking dish, roasting pan, or bundled in a double thickness of foil; drizzle beets with olive oil. Cover beets and bake for 35 to 75 minutes, according to the size and age of beet, or until a knife can slide easily through the beet. Reserve oil from roasted beets. While beets are roasting, macerate (soak) shallot in vinegar 30 minutes. Pour beet oil into a measuring cup, adding additional olive oil to make 1/4 cup. Whisk vinegar and syrup into oil and stir in tarragon; season to taste with kosher salt and freshly ground pepper. When beets are cool enough to handle, remove skins with fingers or paring knife and cut into chunks. Place greens on a platter or on individual plates. 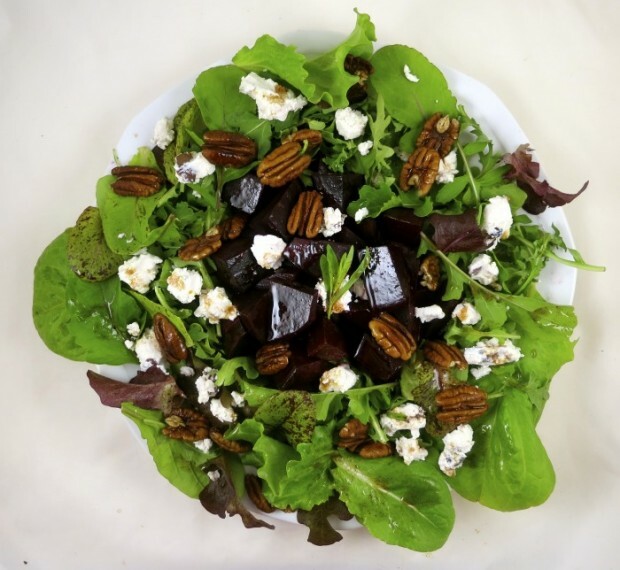 Arrange cooked beets over greens, top with goat cheese and toasted pecans. Drizzle vinaigrette over top and serve. *Smaller beets are sweeter but more time consuming to peel.